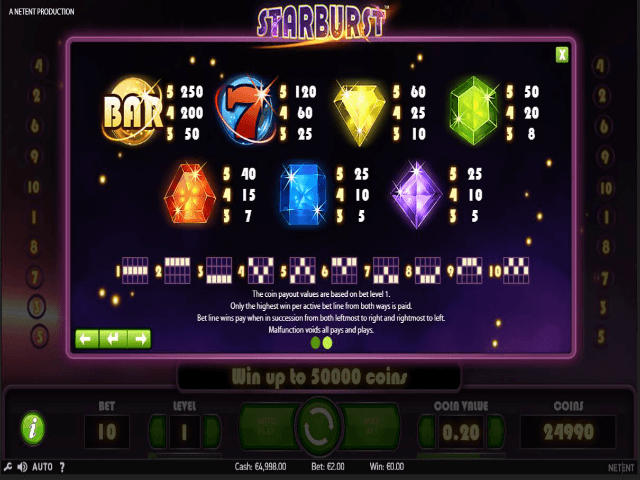 If you keep asking the universe to bring you a slot jackpot, the Starburst online slot from NetEnt could be the answer. With five reels and ten paylines of cosmically infused gaming and playable from 0.10 to 100.00 a spin, this online slot can pay out a maximum jackpot of 50000.00! If you're seeking a slot with a modern arcade vibe and huge potential payouts, read on for more about this beautifully rendered game! Play Starburst Slot Demo for Free! Play Starburst for Real Money! 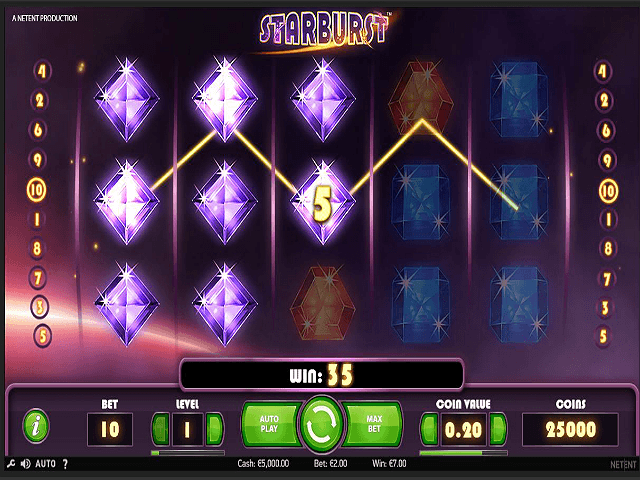 The Starburst video slot from NetEnt was released in 2012, and has fast become one of their most popular titles. The secret to its success lies in its combination of an authentic arcade feel with stunning cosmic graphics, and simple yet powerful payout features. The reels are loaded with an array of symbols including BAR, 7-icon, cosmic jewels and stunning Starburst wilds, with only ten paylines. The mechanics of the game are also very clean, with two-way payouts for basic winning combinations, plus the magnificent Starburst wild feature which can deliver huge payouts. 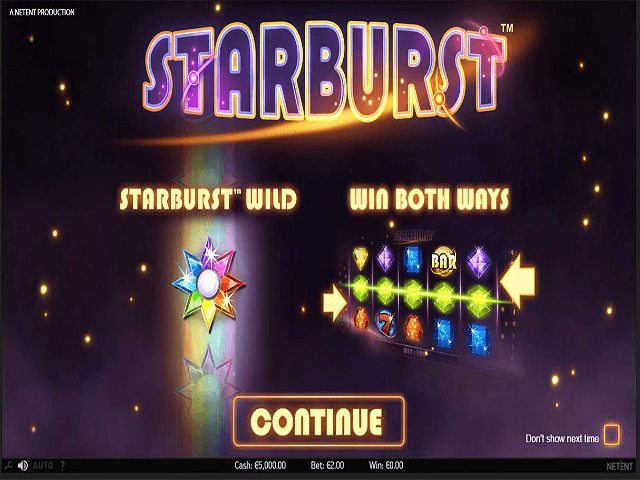 With a fair casino edge giving you average returns of 96.10%, the Starburst online slot is playable with a high spin volume as you search for jackpots. Like an authentic Vegas video slot, the Starburst fruit machine can be played from 0.10 to 100.00 a spin, delivering the potential for a 50000.00 jackpot payout. The base game pays out from three to five symbols both ways on the paylines, with seven different icons to match. The BAR symbol is the highest ranked, with five icons rewarding you with a 250x win. The other icons have prizes ranging from x3 to x120. 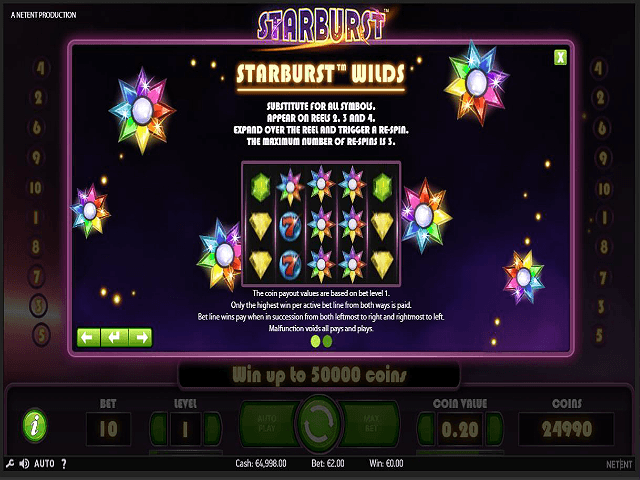 The Starburst online slot is a fast-paced game which can be played manually or on auto spin for non stop action. While the base game is your bread and butter, the expanding wild is what makes the game so exciting. The Starburst wild symbol is an eight-sided star that shimmers on the screen while triggering the expanding wild feature. When the icon lands on one of the three middle reels, it expands over the whole reel for up to three bonus re-spins. What you're really seeking is expanding wilds on reels two, three and four, since this massively boosts the probability of re-spinning big winning combinations. During this feature, if a fresh Starburst wild lands, it will expand and fuse with the other expanded wilds, before re-spinning again. With this in mind, it's no surprise that this feature can pay out up to 50000.00. 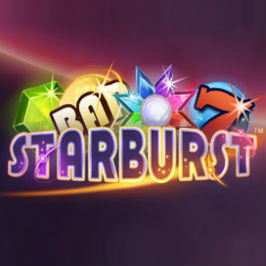 The Starburst online slot delivers a winning formula that makes it one of the most popular arcade fruit machines around. Although base game payouts feature heavily during sessions, the prospect of triggering the expanding wilds keeps people coming back for more. While the maximum payout of 50000.00 might not be within the grasp of the casual gamer, good runs can produce some impressive returns – even at modest stake levels. Share this Starburst Review today! If you like Starburst, you'll love these slot titles too!